The New Gods are one of the most fascinating, imaginative and entertaining corners of the DC comic book universe. Longtime DC Comics fans speak of the New Gods in almost reverent tones, and for good reason. Yet the New Gods are also, arguably, some of the most intimidating and confusing characters to new fans. They’re drawn from a complex world with science fiction and fantasy elements, and they’re proudly strange and unusual. And on top of all of this, we use them a lot. They show up frequently throughout our comics and our animation, and it’s likely only a matter of time until they’re brought to worlds of live action film and TV as well. If you’re not a longtime comic book reader, or if you don’t read comics at all, we don’t want you to be confused and turned away when that happens. So please sit back and enjoy this little primer on the world of the New Gods. These worlds are referred to as twins, but the reality is that they couldn’t be or look more different. New Genesis is a lush green paradise, while Apokolips is a scorched, nightmarish land marked by massive fire pits. Both these worlds exist outside of the DC Multiverse, meaning the Apokolips on Earth Prime is the same one as on Earth-2. So when the forces of Apokolips attacked Earth-2 in the pages of our Earth-2 comic, they were the same forces that are now invading Earth Prime in “Darkseid War.” However, since they exist outside the Multiverse, they require a special form of transportation to get here—boom tubes. That's a boom tube behind the big guy above. If you’ve ever read a comic book with Fourth World characters in it, you’ve almost certainly seen boom tubes. They look something like a wormhole and always appear in comics with a giant BOOOOOOOOOM! sound effect that spans the entire panel. Boom tubes are pretty cool, but what’s most interesting about the worlds of the New Gods are the remarkable characters who live on them. It would be very easy to think of the gods of New Genesis as the “good” gods, and that’s largely true (though as always, things aren’t completely black and white). They’re ruled by Highfather, a benevolent and wise leader who promotes tolerance and justice. However, he is more than willing to fight to defend his people and the greater universe against the forces of Apokolips, and he doesn’t go into battle unprepared—he has some spiritual help. Highfather is capable of communicating with the Source, which is a giant wall of energy that binds all of known existence and that provides guidance only understood by Highfather. If the New Gods have a God, it’s the Source. The gods of New Genesis are all nearly as remarkable as their chief. Most live in a city called Supertown, which hovers above the planet’s surface so as not to disturb the natural world below. They value nature… but don’t think for a minute that they’re not technically advanced. In fact, they’ve created one of the most astonishing bits of technology in all of comics. A Mother Box is a sentient supercomputer with seemingly infinite capabilities, many of which are unknown even to their users. They can function as a weapon, provide information, heal their user and open boom tubes. Crafted out of a mysterious element, they’re believed to have ties to the natural world and possess a real bond with their user, often self-destructing when their user dies. But among fans, they’re most known for the series of “pings” with which they communicate. But impressive New God technology doesn’t stop there. There’s also the Mobius Chair—one of the most powerful items ever created. The Mobius Chair is a large, throne-like seat that is usually seen hovering above the ground and is almost always occupied by Metron. A New God who claims to have allegiance to neither New Genesis or Apokolips (and yet who seems to do good more often than not), Metron is an observer, interested only in acquiring knowledge and experience, all of which is held within the Mobius Chair. The chair also allows him to fold time and space and travel into alternate dimensions, including, of course, Apokolips. 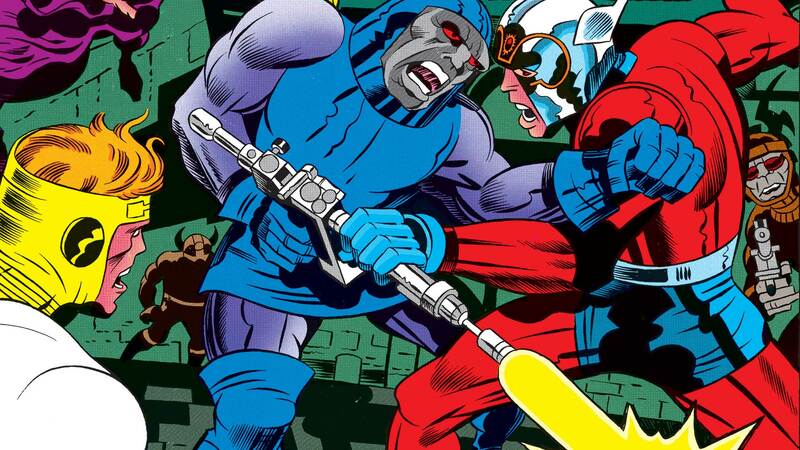 Even if you’re completely unfamiliar with the New Gods, you may have heard of Darkseid. Over time, he’s become known as a major DC Comics villain in his own right, outside of the Fourth World mythology. But he originally debuted within the New Gods and is still a huge part of the mythology. While Highfather is benevolent, Darkseid is ambitious, destructive and cruel. He seeks to conquer the universe and eliminate free will, using his formidable power to pummel worlds into submission until they serve his every whim. And if you have any doubt as to whether he’s capable of it, all you need to do is look at Apokolips—that’s exactly what he’s done there. Every creature on the planet works in servitude to Darkseid in some way, and that servitude comes with a frequently high cost. Darkseid’s legions sacrifice their lives for him by the hundreds. However, there are some upper ranks on Apokolips. Slightly above the common slaves you’ll find the Parademons, winged creatures completely loyal to Darkseid who form the bulk of his attacking force. There are also the Female Furies who serve as the upper echelon of Darkseid’s guard and are some of his fiercest—and strangest—warriors. Led by the very ironically named Granny Goodness, who looks like a kind, grandmother-like figure, but is brutally cruel, the Furies have also included the likes of Lashina (who wears bandage-like coverings and fights with a whip), Stompa (a broad-shouldered female bruiser), Mad Harriett (a frightening fighter who’s also utterly insane) and perhaps most famously, Big Barda (more on her later). Granny Goodness is also a part of Darkseid’s Elite—a collection of his most powerful warriors and leaders. They also include the sadistic counselor Desaad, the master manipulator known as Glorious Godfrey, Darkseid’s uncle and general Steppenwolf and the master assassin named Kanto. Finally, there are Darkseid’s sons: the massive and massively destructive Kalibak, the egotistical and treacherous Grayven and the strong and fierce Orion. The fact that Darkseid is a family man (er, family god?) is of note because believe it or not, the single most important event in New Gods history has to do with the rigors of family. New Genesis and Apokolips have always been at odds. However, they did broker a truce once that altered the world of the New Gods forever. Understanding that endless fighting between their planets benefitted neither side, Highfather and Darkseid agreed to stop the violence. But millions of years of distrust aren’t easily brushed off, so to ensure that the treaty was honored, each would give up a son to the other. Highfather took in Darkseid’s second son, Orion, while Highfather’s son Scott Free was sent with Darkseid. Orion was a challenging child, full of rage and deceit. But Highfather and the gods of New Genesis were ever patient with him, and over time, Orion learned to control his anger and channel it into more productive avenues. He became one of New Genesis’ best warriors and one of his biological father’s most challenging foes. Scott, unsurprisingly, had a far bleaker childhood. Reared in one of Granny Goodness’s “Terror Orphanages,” his life was cruelty and brutality from morning to night. When he grew older, he met Big Barda, the strongest and most powerful of the Female Furies, who sensed his inner warmth and kindness. The two fell in love and joined a rebellious sect that taught them the importance of free thinking and innovation. Eventually, both escaped Apokolips and fled to Earth. Scott adopted the name Mister Miracle and the two got married. Darkseid had long since anticipated and even planned for Scott’s escape, seeing it as an opportunity to attack a now-unprepared New Genesis. However, he didn’t foresee the loss of Big Barda, nor the fact that Orion would develop into such a difficult opponent, ultimately defeating Darkseid multiple times. But the greater significance of this famous storyline has to do with shaping the world and themes of the New Gods itself. While Kirby’s Fourth World is full of strange inhabitants, psychedelic imagery and complex technology, at its heart, it’s really a story about family and environment. It’s about nature versus nurture, and about the ability of love to conquer all. It’s a broad story, but the themes that run throughout it are about as universal as they get.